A must-see for the approximately 4 million people who visit Arlington National Cemetery each year is watching the Changing of the Guard at the Tomb of the Unknowns. Most of these visitors marvel at the precision and discipline shown in the ceremony, but not everyone truly understands what it means to be a Tomb Guard, one of the members of the 3rd U.S. Infantry Regiment, a.k.a. "The Old Guard," who serve at Arlington. Two Army veterans and former Tomb Guards want to change that. They created "The Unknowns," a documentary about the Tomb of the Unknowns and its sentinels who guard it 24 hours a day, seven days a week. "I’d get glib questions, like ‘Why do you guard the tomb? Are they going to come out?’ " said producer Ethan Morse, who guarded the tomb from 2005 to 2006 and earned Badge 548. "I realize that they’re just disconnected from it, so we want to preserve the legacy and make a whole new generation aware of what that is." Morse and director Neal Schrodetzki were given unrestricted access to film since they both served as Tomb Guards. "The Unknowns" covers portions of the training program and aims to replace myths with facts surrounding the monument dedicated to service members who died without their remains being identified. After leaving the Army, Morse and Schrodetzki went to film school in Los Angeles. Then the Society of the Honor Guard reached out to the budding filmmakers to create a short memorial for one of its soldiers. "We always wanted to film the actual training," said Schrodetzki, who was a guard from 2006 to 2007. "We realized 'this is the time,' and it turned into a whole feature film." After securing earning $15,000 from a Kickstarter campaign, Morse and Schrodetzki flew to Washington, D.C., for about three weeks in 2012 to film at the tomb. There’s also footage of Morse’s last walk as a Tomb Guard in 2006. 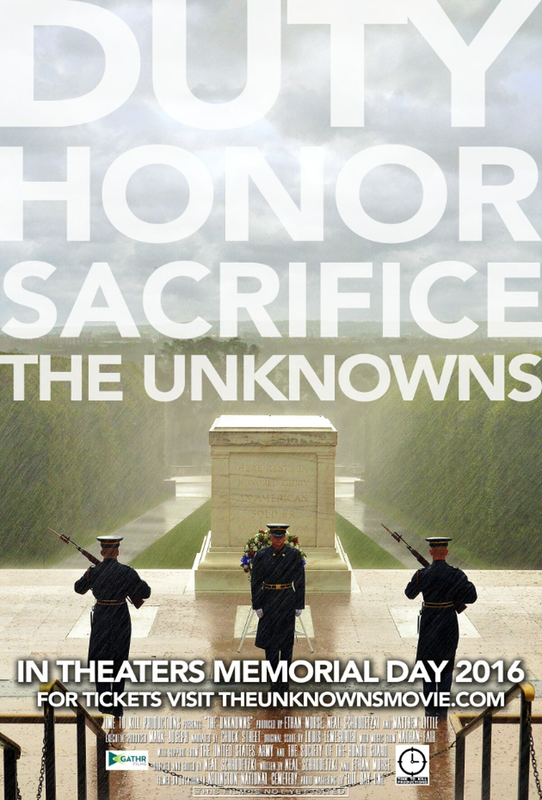 "The Unknowns" will be shown starting on Memorial Day through Gathr, which screens movies depending on how many people buy tickets. Click here and type in your ZIP code to find screenings near you. A few cities will have screenings prior to Memorial Day. "Any community anywhere can request a screening all summer long," Morse said. If the theater doesn't meet the number of tickets it needs to sell, then the screening doesn't happen and no one is charged. "No harm, no foul," Morse said. 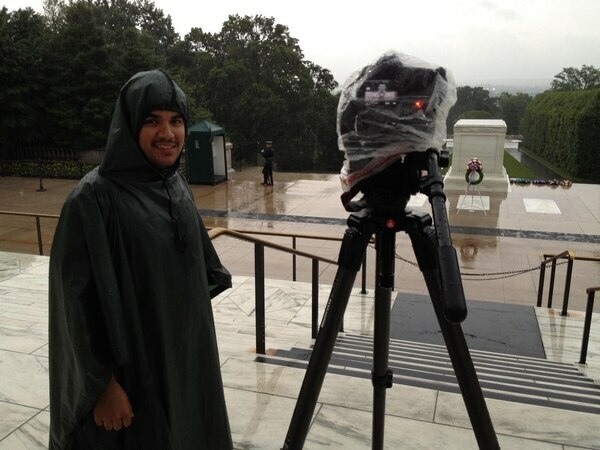 Film crew member Mario Martinez shoots video in the rain. Almost 100 screenings are in the works, and about half of those will be hosted by former Tomb Guards who will answer questions after the film. Morse and Schrodetzki said they want people to learn more about the soldiers they see guarding the tomb. "I think it's hard for the younger generation to realize how much we sacrifice to enjoy our freedom," Morse said. Schrodetzki said there are so many monuments in D.C. that sometimes it's hard to truly understand what they represent. Even though he was a Tomb Guard himself, he said going through the filmmaking process has deepened his own understanding of the Tomb of the Unknowns. "It's representative of people that fought for a cause and not for credit and recognition," he said. 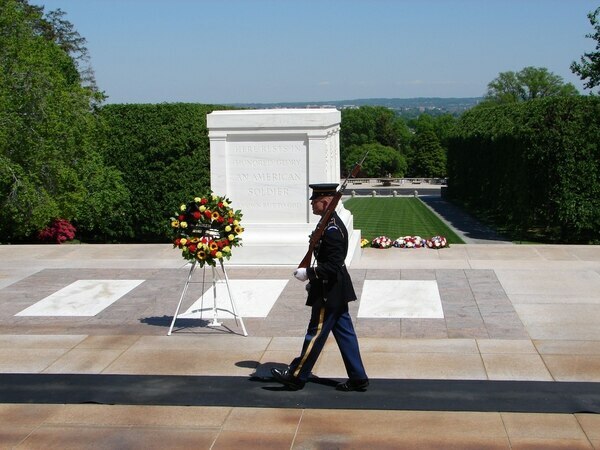 Matthew Little, a producer and marketing consultant who helped make "The Unknowns," said that although he never served in the military, he has a huge respect for the dedication of the Tomb Guards. "We'd have our weekly meetings, and I'd come in and start complaining about how busy and stressed I am," Little said. "Then I remembered who I was talking to — these guys used to pull 24-hour shifts." Sentinel Matthew Perovich, Badge #541, guards the Tomb of the Unknowns. Little said that a lot of times, visitors to the Tomb of the Unknowns think, "Oh, it's a cool shrine, and there's this cool guy flipping his rifle." "But they don't take the time to learn what it means because they just don't have time," he said. "['The Unknowns'] is an extra resource for people to learn more about it." The film is also for people who don't have the opportunity to visit Arlington National Cemetery, Little said. "We want this to be a small way to feel like you're there and learn more and see what others are doing to honor their fallen friends," he said.